Etiquette is a funny thing. The rules are often unspoken; a delicate maze of social norms we’re expected to indulge for fear of disrupting the status quo. So, when it comes to our manners within the home compared to the rest of the world, how do Aussies stack up? According to director of the Australian School of Etiquette, Zarife Hardy, Australians tend to have less of a fascination with etiquette than many overseas. “Australians have a very relaxed and casual approach to common etiquette. After all, etiquette is all about how you make someone feel in your presence, whether that be formal or informal. Some areas of etiquette are slipping but this seems to be happening globally, mainly due to technology and the use of mobile phones,” she says. She notes that although we generally conduct ourselves in a way that is not dissimilar to how others do overseas, we have our idiosyncrasies that set us apart. “As Australians we eat Continental English style, which is different to many countries in the world; we follow England and their table etiquette rules. This means our fork goes in the left hand and knife in the right hand, with the tines of the fork always over and never up. Laying your knife and fork in the middle of your plate with the blades of your knife facing in is our signal to show that you are finished your meal even if food is still on the plate,” she says. 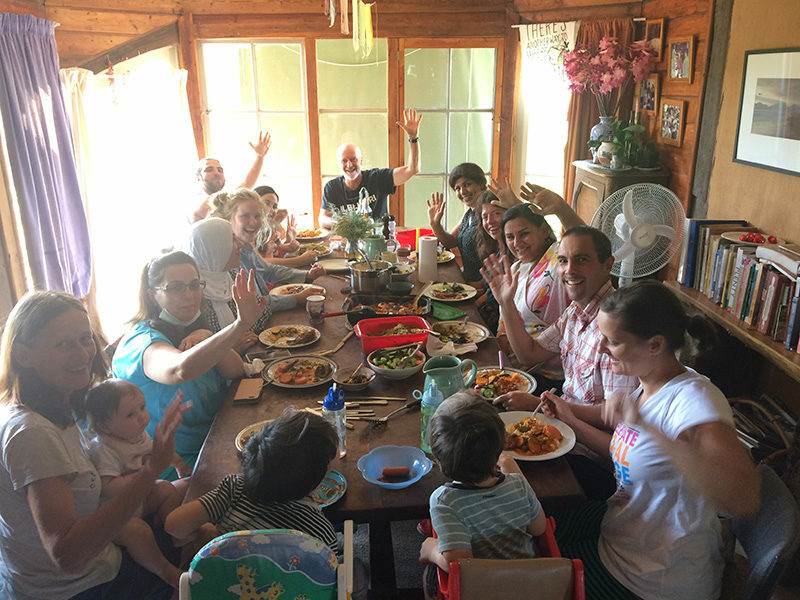 Hardy also says that while barbecues are a common Australian way of bringing people together in the home, it’s not “a common form of entertaining in the global arena”. More than that, the Australian etiquette for greetings is distinctly, well, Australian. While Australians are generally relaxed, we do have firm ideas about how we should respond to food, Hardy says. “The rules of etiquette are about making other people in your company feel comfortable, never making them feel like they don’t know or have done something awkward,” says Zarife Hardy, director of the Australian School of Etiquette. We’ve all been here. Your food has been placed in front of you but others are still being served. The temptation to have a taste is overwhelming, but one to resist. “You do not touch your cutlery or your plate until everybody is served,” says Hardy. Why? It’s just not polite. Even if family dinners are a bit more relaxed, it’s respectful to wait until the person who prepared the meal can enjoy the fruits of their labour as well. Casual settings, such as barbecues, can be an exception. If you’re a guest at someone’s house and your host tells you to start your meal, feel free to go ahead. “The basic rules always apply: sit up straight, use your cutlery properly, small mouthfuls, and don’t make a lot of noise as you’re eating,” she says. Good posture is important because it shows you’re engaged with your company. While using numerous forks for a single meal doesn’t have much relevance for the average diner at home, Hardy says it’s still important to know how to hold cutlery, and how to place it when finished eating (knife and fork side by side in the middle of the plate). Wildly gesticulating with it is best avoided. Remember being told as a child to keep your elbows off the table? It turns out that rule isn’t just about appearances, but giving others ample room. Hardy says it’s a good idea to avoid controversial topics, particularly if you don’t know your companions well. Having the TV on or off during dinner used to be a matter of some debate, but smartphones and tablets have taken the issue of technology at the table up a level. Hardy says phones are a big barrier to socialising with family and friends, and shouldn’t be allowed at mealtime. Put them away, preferably in another room so notification alerts won’t be a distraction. This should really go without saying, but remember to thank whoever has prepared your meal, even if it wasn’t to your taste. Obviously table etiquette varies between cultures and homes, so Hardy advises that when in doubt, follow your host’s lead. You might prefer to eat pizza or a burger with your hands, but if everyone else is using utensils, just follow suit.